We can normally recognize a Revival Cycles build immediately. The bikes have top-level craftsmanship, perfect proportions and tasteful finishes. But this bizarre contraption had us puzzled. 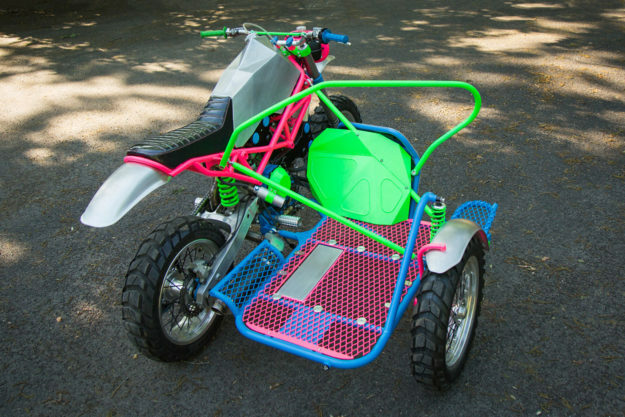 Sure, the hand-made bodywork and crafty engineering pointed towards Revival… but what about the three different neon hues, and that weird sidecar? 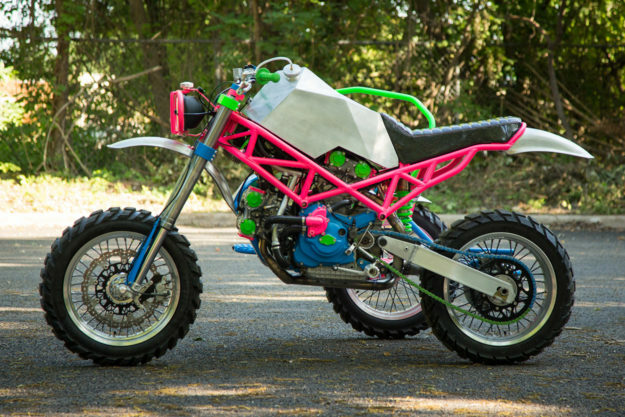 And what possessed the Austin, Texas shop to take a Ducati ST4 and turn it into, well… this? Alcohol, apparently. And a love for the mental sport of sidecarcross. 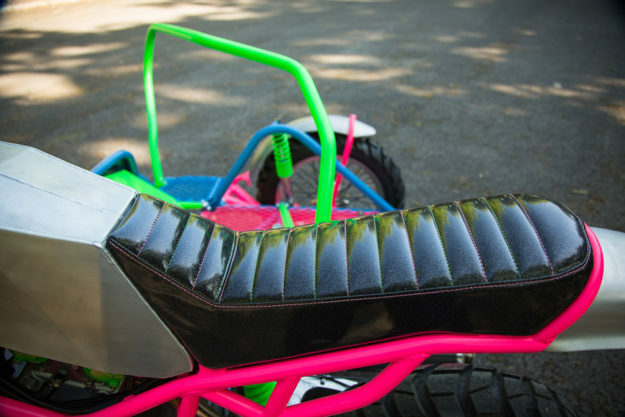 The idea resurfaced when Rebel Yell asked Revival to build a custom for them, to give away in the Rebels Uncaged contest. With Ducati’s legendary 916cc, 4-valve, DOHC Desmodromic ‘L-twin’ at its heart, the ST4’s good for 107 horses and 89 Nm of torque. And it has a pretty sweet power curve too; an audacious machine to go ‘crossing with. Revival started—as they usually do—by stripping the bike down to the frame and engine. They then began the arduous task of designing and fabricating the sidecar. 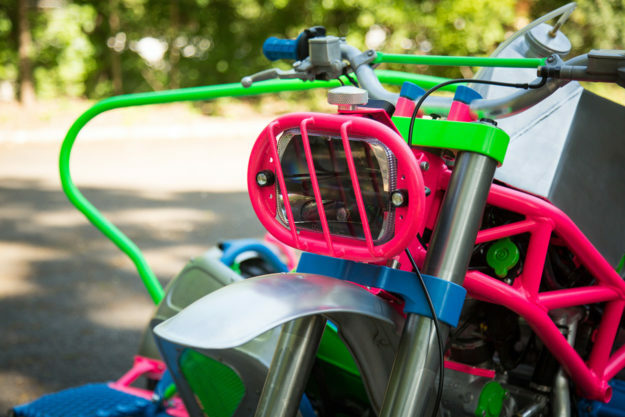 The framework’s been constructed from chromoly steel, with a healthy dose of ‘monkey bars’ to give the sidecar rider (AKA the ‘monkey’) plenty to hold onto. 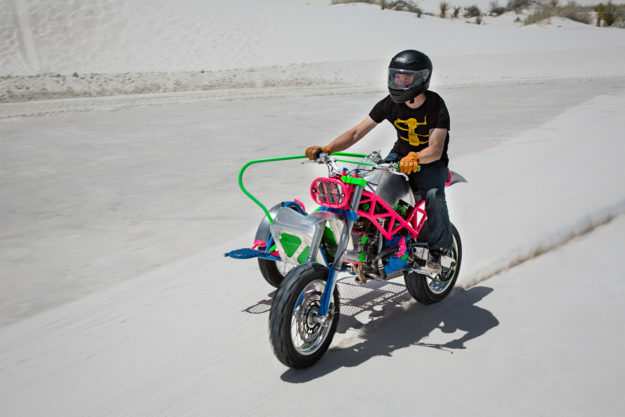 The sidecar also features its own long-travel swingarm and shock setup. Revival moved the radiator, oil-cooler and a Lithium-ion battery all over to the sidecar too, to free up space on the Ducati. That left enough room to fit a set of rebuilt and beefed up 48mm WP Suspension forks from a KTM, giving the bike the ability to soak up those landings. 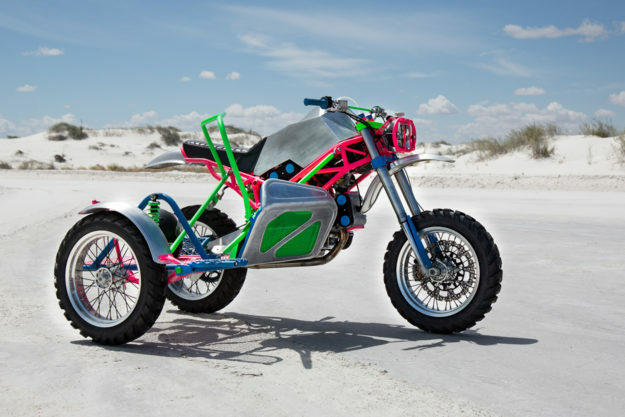 The rear setup consists of an alloy Ducati Monster swingarm, mated to a custom-built Öhlins shock. The suspension is fully adjustable at both ends, and the brakes are Brembo throughout, with a Brembo clutch master cylinder and upgraded lines. All three wheels are 17” Warp 9 units, wrapped in Metzeler Karoo 3 tires. Revival’s legendary fabrication skills are on full display here. 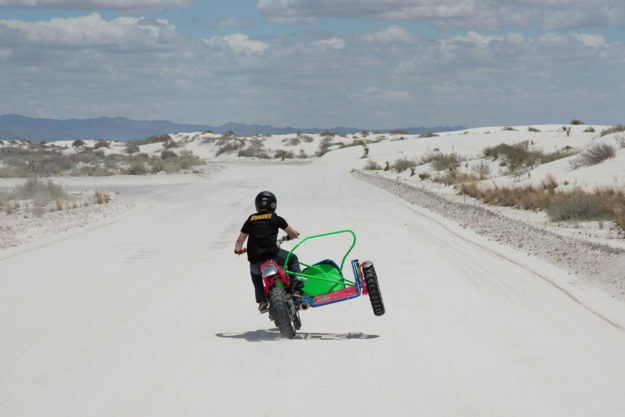 The angular fuel tank and sidecar fender are one-offs, made from lightweight alloy. The fenders are modded Honda SL350 units, but the headlight surround, fork guards and radiator panel are all one-offs. The Ducati’s subframe is all-new too, with a custom seat sitting up top. Revival even hand-shaped their own aluminum coolant hard lines, complemented by braided oil cooler lines and AN fittings. 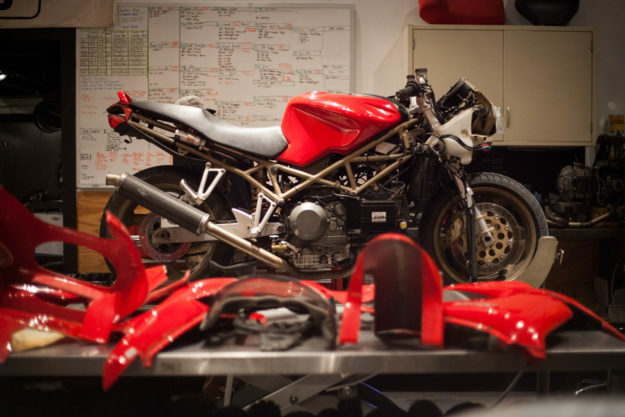 The Desmo now breathes in through a pair of K&N filters, and out through a custom-built stainless steel two-into-one system, capped off with a Termignoni muffler. Revival rewired everything around a Motogadget m-Unit controller too, using one of their own Revival Deluxe Wiring kits, and added LED lighting all round. Up top are Renthal Twinwall bars, with a Domino Mostro single pull throttle. The mini switches and tiny digital speedo—mounted right behind the headlight—are from Motogadget. 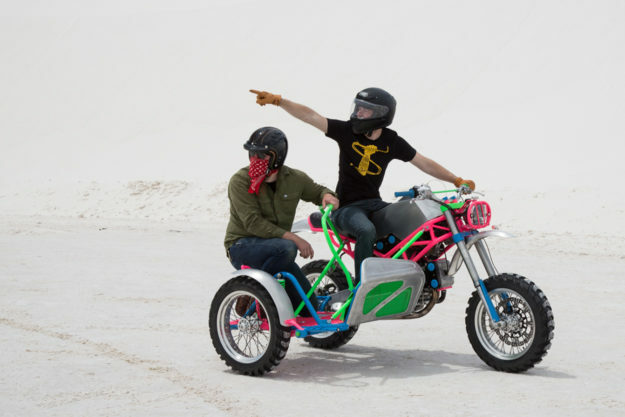 “After completely rewiring the entire bike and upgrading the fuel, braking, and suspension systems, the final bike weighed in at just over 380 pounds, without the sidecar,” Revival tells us. 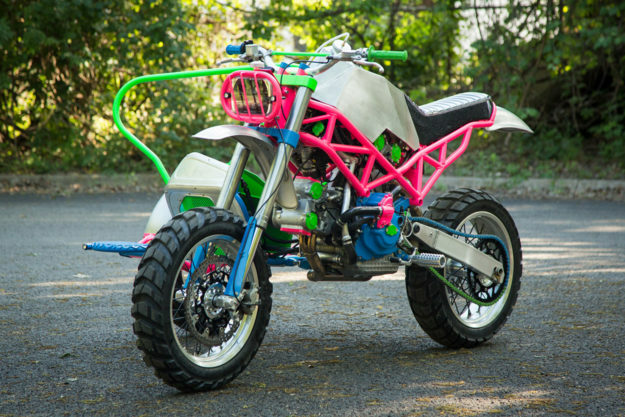 As for the not-so-subtle, 80s color palette, that was a no-brainer for the Texan crew: “When it came down to it we realized that the colors had to speak to the fun that this bike was likely to unleash.” There’s neon pink, green and blue everywhere you look, and the seat’s even been covered in metallic grey vinyl, with green and pink thread. 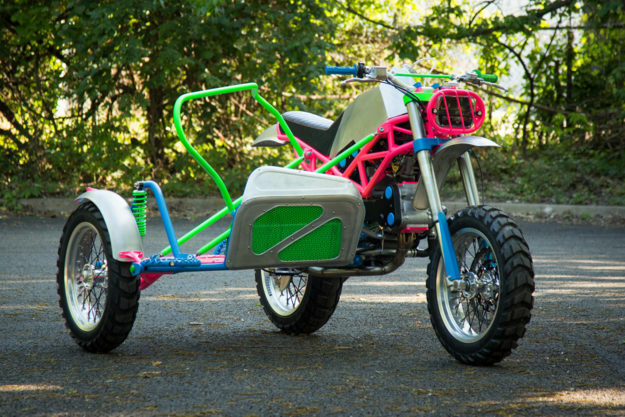 It’s a pretty bold move—but then again, this is a 107 hp sidecarcross bike. And it doesn’t get much more off-the-wall than that.